If there’s one bit of luxury that I can’t get enough of, it’s having the opportunity to work directly with a designer or studio to create a bespoke piece. It’s pure joy. The process of creating an item from scratch is inherently personal. It’s the nuance of your tastes and preferences laid bare. Working directly with designers and studios on pieces has made me acutely attentive to the subtleties of my style. I’ve long had a special place in my heart for bespoke shirts. Perfect button downs from Charvet worn with Alaia skirts just like Sofia Coppola. Ever such elegant silk shirts that drape just so. For someone, with a slim build and narrow, pointy shoulders, coming up with a few good designs for shirts has been a small mercy. 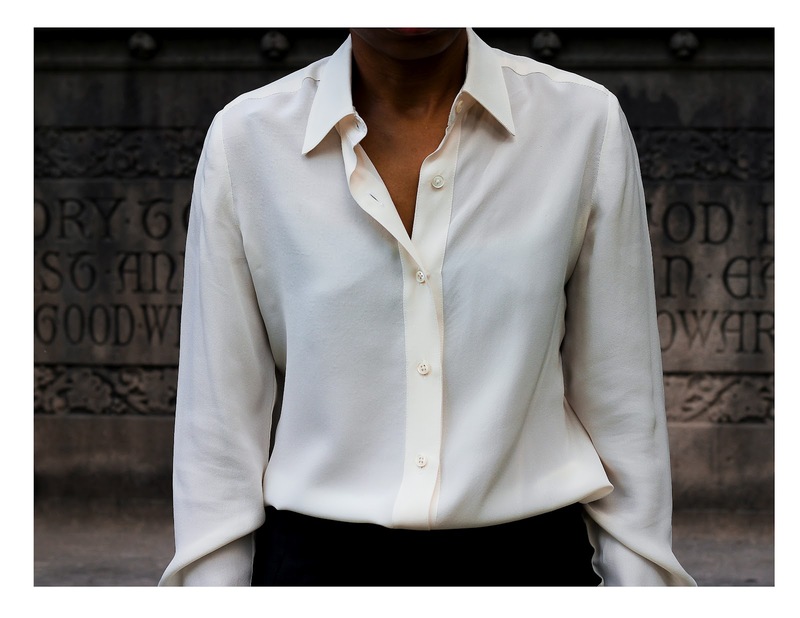 Drapey, slouchy, but tailored to perfection, my silk shirts in ivory have long been wardrobe essentials. There’s just something so polished and at the same time nonchalant about a luxurious silk shirt. When Philip Cheng and Jack Chui of Soong Salon De Mode came to New York back in the spring, I had my mind made up, that I would have this shirt made*. We spent a Saturday morning looking over my inspiration images, fabrics and sketching a few ideas. It never ceases to amaze me that this pair can bring a garment that I envision to fruition. Philip Cheng and Jack Chui are such perfectionists and do beautiful, precise work. It’s the type of classically beautiful work that you don’t see often and that always garners compliments. Something kept telling me to have a couple of my beloved silk shirts made in a lighter momme weight. I found a beautiful ivory/cream silk that manages not to be too sheer. Over the summer, my shirts arrived- gorgeously packaged, immaculately pressed and folded with acid-free tissue paper. A few fabric swatches and plenty of extra buttons accompanied the package. Worn half-tucked like a French Voguette, I’ve been living in my silk shirts. During fashion week they were most certainly a chic go-to. * The cotton voile shirt with puff sleeves and a Peter Pan collar is just as enchanting as I imaged. Sue- Thanks Sue! That's very sweet of you. I do feel very chic in my collection of silk shirts. Yes, I really love having things made. I also find that tailors and designers love working with someone who care about precision, technique, fabrication, etc etc as much as they do. You can tell that they get so excited about it. Yes, when I was in Hong Kong I did look at Sam the Tailors! Having an item custom made is as much about the experience as the actual item. I love the idea of custom made suits for men. Oh and the perfect camel coat would be beautiful. I was talking to Ammu about the luxury of having things made for you and I wish there are more opportunities to shop like that in Singapore and feel like I have a relationship with what I buy and whom I buy from. Perhaps I will go down that route for my perfect blazer. Happy for you that your shirts turned out precisely what you hoped for! It is so hard to find light-coloured silk shirts that aren't near transparent or too shiny. I wasn't that impressed by my ivory silk shirt when I got it but now I realise that the fabric alone was rather worth paying for - perfect weight! lin- Yup. I like having a relationship with who I buy from. I also don't like having the exact same thing that every girl has. Yes, there exactly like the first ones from HK in a lighter weight. The nice thing is that they do such a wonderful job of keeping the measurements, sketches, fabric, muslim that I can re-order at any time. Yes! Bespoke clothing is the ultimate luxury. I feel so spoilt after living in India with access to some incredibly talented designers. The whole business of getting things made rather than just buying straight off the rack has made my shopping process much more considered and really taught me to take my time. Your shirts sound lovely. I would love to see pictures of the Charvet-inspired shirt. I bet it looks wonderful. Ammu- I couldn't agree more, it really is the ultimate luxury. That's an excellent point about it forcing you to take your time and evaluate what already exists in your closet. Yes, stopping into see Anne-Marie Colban at Charvet for basics is always fun. She's just so precise and talented. Yes, the Charvet-inspired shirt looks wonderful. I just need to figure out how to photograph it. I love that you've made such an investment in these shirts. The images show how beautifully they fit you. I bet you walk taller in this shirt, yes?! Hello Lindsay! The ivory silk blouse is lovely and flattering:) What a luxurious experience it must have been to have something tailored personally for you from beginning to end. The closest experience I have of this was the making of my wedding gown which was indeed unforgettable! I remember selecting the French fleur lace and the shade of white for the duchess satin and it was really a lot of hand-on fun. Cant wait to see the cotton voile shirt! Eileen- Hi Eileen! Thank you! That's very kind. Yes, it's such a luxurious experience and a lot of fun too. I love being able to select everything and come back and forth for fittings to make sure it fits perfectly. A custom made wedding gown sounds amazing. Such a wonderful way to make such a special day even more memorable. You should blog about it. There are so many laces and shades of white to pick from. The cotton voile has become such a favorite lately. I remember Sam the tailor in Hong Kong! Sadly, his workmanship is nowhere near what it used to be but we found another amazing tailor not too far from Sam. Having it just made for you made the experience even more special. That's luxury for you. I remember the silk shirts I bought at a "luxury" store in Shanghai more than 20 years ago. The quality and tailoring were impeccable. I paid a princely sum of $10 per shirt. I wore them so much for the next 6 years that they finally fell apart from constant washing and drying. Chocolate Cookies & Candies- Yes, that's why I ended up going to a Soong. I wanted someone who could not only just do beautiful tailoring (there are a lot of people who can), but could also deal with complex design elements and who understood that I wanted top quality fabrics. I wanted someone who was used to dealing with people who knew about design and fabrics and that sort of thing. They came highly recommended to me by people in the fashion industry. The shirts that I purchased last March are still going strong. Yes, the entire process is very special and luxurious. Now I only want to wear my Charvet shirts or these silk shirts and more recently the cotton voile shirt. That's great that you found a good tailor. PERFECTION! The draping is so exquisite. I bet you get asked about your blouses a lot. I don't think you could be any chicer. Anonymous- Thank you! That's very sweet. I love gentle draping. Yes, I get asked about my blouses a lot. The sartorially astute will ask if I they were made specifically for me:)But most, will ask who designed them. That shirt has perfection written all over it. I love the way it softly drapes and ivory is the perfect colour too. Amanda- It is such a staple item! I could live in them. White button up shirts are so hard to find. I had a couple made at Charvet that have worked well. It feels good to have something that fits perfectly- a very good feeling. i love love love the idea of bespoke shirts. just had one made recently and will do a post on my blog when it's finished! agreed that a trove of creamy silk blouses are such essentials that will take you everywhere. miss sophie- The bespoke shirts are such a nice idea. I do love your Equipment shirts- they just don't fit me. There's no drape or tailored slouch:( Can't wait to see what you came up with! Yes a trove of creamy silk blouses can go everywhere. I love how they can be worn everywhere and can be dressed up or worn more casually. Beautiful! I love the matte silk. I used to be a cotton shirt exclusive, but after finding a great silk shirt I wear it all the time. It's so easy, I just throw on a tuxedo blazer to go out at night. Dressy enough for fancy places yet not out of place in a casual bar. I would love to try the custom route, I have trouble finding shirts that don't gape at the bust. koko // res pulchrae- Thank you! I love matte silk too! You're so right about a silk shirt looking perfect with a tuxedo blazer at night. I love that a silk shirt can transition so easily from day to night. So many women have issues with shirts gaping at the bust- you would think more designers would take note. I think every woman should try the custom route at least once. I bought a silk blouse about a month ago, and you're right, it's versatile, beautiful, comfortable - and an absolute necessity! Yours fit you so well, what remarkable tailoring! Vanisha @ Vanishas Life In...Australia- Thanks Vanisha! Hope you're feeling better. The silk shirts are so comfortable. A lot of fabrics (synthetics, many wools) can really irritate my skin- so I love having natural fabrics that are very soft. The silk blouse is so gorgeous and versatile. heart in a cage- Thank you! That's very sweet of you. That blouse really is gorgeous!!! I recently got into Equipment shirts and I can't get enough! I miss your blog too! I recently moved and my husband just got the internet up and running! Hope you're settling into your new home. Kudos to your husband for getting your internet up and running. So chic & timeless, this white blouse is perfect! Style Reload by Virginie Peny- Thank you! That's exactly it- the silk blouse is so chic and timeless. I love that. The shirt is just beautiful & it fits you like dream! I love how fluid the fabric is that's been used, it makes it look so effortless & luxe. I think classic pieces like this that you'll wear time & time again are definitely worth the investment of getting made custom. FAIIINT- Thank you. Keeping the shirt fluid, effortless and luxe was exactly what I had in mind. It's so true- it is an investment in time and money to go the custom route, so it makes sense to work on a classic piece that you'll wear forever. Nothing can ever look bad on you. you have great proportions... long, lean and whippet-thin but this is so perfect. You always get it right. I think every woman needs a timeless piece like his shirt in her wardrobe ! Thank you! It's such a timeless piece. I couldn't agree more. The shirt is so wonderfully made. Bravo to the tailors! It suits you perfectly! Aïssa- Hi Aïssa! Thank you. So wonderfully well-made. It's amazing to see how skilled the tailors are. Absolutely perfect shirt. I agree it's such a luxury to have your clothes tailor-made and to follow all their development process. I used to have a bit of that luxury when I was growing up as my grandmother was a seamstress and would make many of my clothes. I didn't appreciate it properly at the time (well, also because we were too close - relatives - and would often loudly disagree on how garments should look like...), but now I can see the privilege it was. How lovely that you were able to grow up with such love and care put into your clothing. I love that! I can't imagine the amazing skills your grandmother must have! What a classic and minimalist look! I love good pieces that you can mix and match with other classic pieces. That top could easily be worn with a skirt or with clean dark washed jeans. I also love how clean your blog looks. Tyne Swedish-Hi Poppie! Thank you for the warm words on my blog. I'm so glad you like the look of it. You're so right about good classic pieces that you can mix and match. I love that! You are so right about this blouse being perfect with a skirt or jeans- it just always seems to work. This is perfect on you! I want to get a white silk button down, but I'm not sure if I would have enough places to wear it. This post is inspiring me! LN- LN! It's good to hear from you. Thank you! It's so nice to find something that feels very perfect and organically me. I think silk shirts are very versatile. A white one would look lovely on you and could be worn quite casually too! LN- I know the feeling. It's a never ending cycle. missrdevine- You're so right. The silk shirt has been worn by many a style icon over the years and yet it is still so relevant. It's worth holding out for the perfect fit. Anonymous- You're welcome! Thank you for stopping by. Lovely! Finding fabric weight that is heavy enough to not be translucent in white, but still drape beautifully (which pretty much all silk does) is totally the trick! This looks amazing--enjoy! petrichore- Thank you! I spent so much time researching/working with different fabric weights that I've gotten quite keen on being able to recognize the different momme weights. "If there’s one bit of luxury that I can’t get enough of, it’s having the opportunity to work directly with a designer or studio to create a bespoke piece. It’s pure joy. The process of creating an item from scratch is inherently personal. It’s the nuance of your tastes and preferences laid bare. Working directly with designers and studios on pieces has made me acutely attentive to the subtleties of my style." This is so eloquently put and it reflects my exact sentiments about expressing personal style! Hi, i really enjoy your blog. i love a good shirt and blouse and im totally inspired by your chic style.